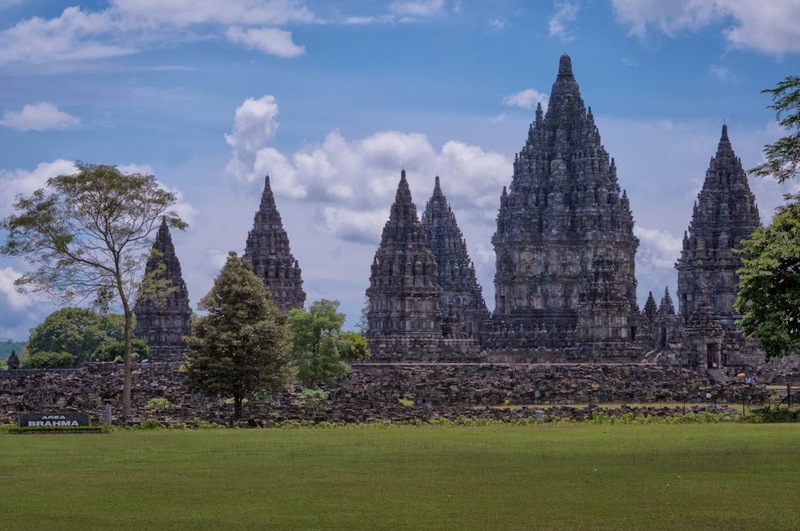 Prambanan is a Hindu temple built around 850 and abandoned beginning around 950. The temple complex was originally named Shiva-grha or Shiva-laya in homage to Shiva. It likely got the name Prambanan from the nearby village, though there are conflicting opinions on that. The temple was built by Rakai Pikaton of the Hindu Sanjaya Dynasty probably to show that the court had changed from Buddhist to Hindu. Also, because there was a really big Buddhist temple nearby and that couldn’t go unanswered. In the 930s, the royal court moved to East Java, probably due to volcanic activity. That was the beginning of the end for the temple, until its “re-discovery” in the early 1800s. Though the local people have always known of the temple, it wasn’t a mark on the world stage until Sir Thomas Raffles’ involvement. One of his hired surveyors found the ruins and made a report, which caused more surveyors and more reports which led to some mass looting which led to some poor archeology which led to more looting. In 1918, reconstruction began in earnest and the main temple dedicated to Shiva was restored in 1953. 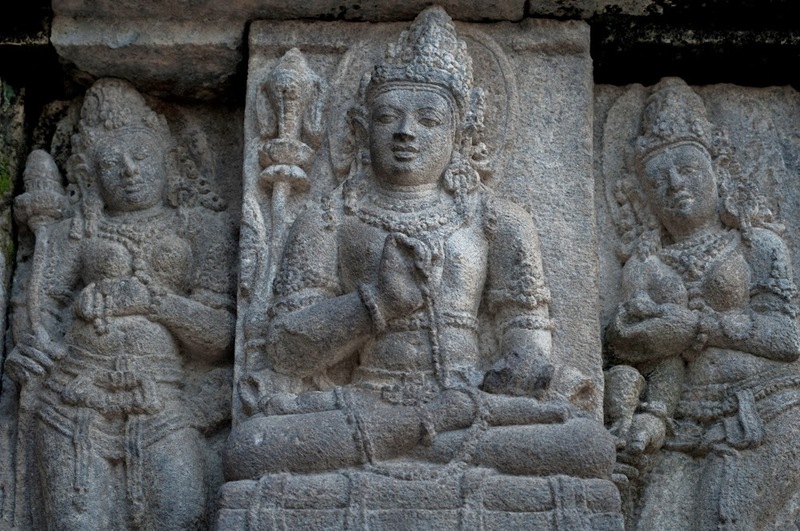 The restoration of the temples has continued though possible restoration is slowing down. The temple and surrounding area have been declared a UNESCO World Heritage Site and are now in use for tourism, religious practice and cultural conservation. The archaeologists are only restoring temples that have more than 75% of their original stones available. Due to the heavy looting and re-purposing of the stones in the 1600s and 1700s, many of the stones are no longer available. The original complex at 240 temples. The three big ones were dedicated to Shiva, Bramah and Vishnu with 3 slightly smaller temples dedicated to their mounts. An additional 10 small shrines are located on the 4 cardinal directions inside the wall. The majority of the temples (224) were placed in four concentric rings around the wall. Smart people like to debate why and what it represents. I won’t go into that for fear of the smart people. To show respect to the temple, everyone wears a wrap skirt, much like a sarong. Because most tourists don’t have this on hand, they have bunches. As you walk through the ticket booth, they wrap a strip of fabric around your waist and tie it, mostly without speaking. If I hadn’t known ahead of time about the respect thing, it would have been a bit abrupt and abrasive. As it was, I found it funny. The approach to the temple is startling. Though you can see the temple in the distance, it sneaks up on you when you come out of the ticket booth. Its like you were far away and by crossing into the ticket booth, you teleport much closer. 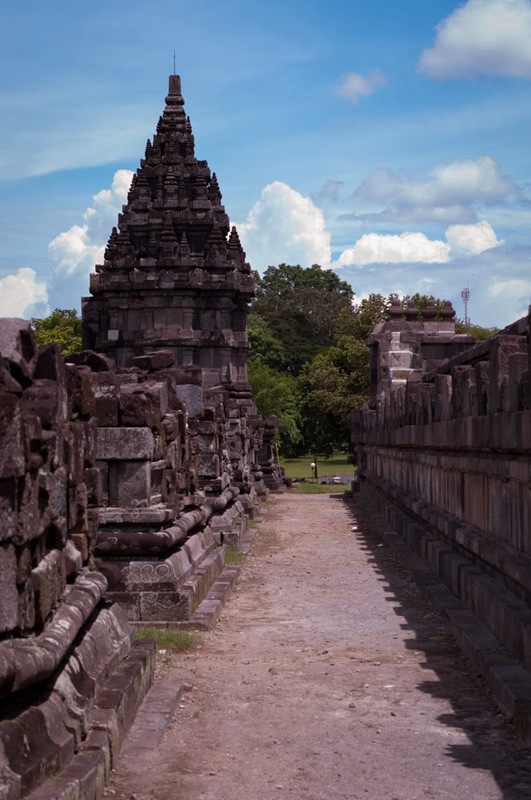 There are two main areas in Prambanan. The first is the area is enclosed in a fence and holds thousands of blocks. The blocks were once a part of different temples, but the temples have fallen or been dismantled. In many cases, the foundation of the temples is still standing, but there is no information about what it once looked like. Instead, the blocks are stacked in neat piles in hopes that there can be more reconstruction in the future if new information comes to light. The second area is the main temple. A ten foot wall surrounds it, though the ground on the inside has been raised about six feet, making the whole thing tower even further above the surrounding countryside. The ground is packed, dusty dirt that kicks up puffs with every footfall. The temple itself is actually a collection of buildings, not one large complex. The three main buildings are dedicated to Vishnu, Shiva and Brahma with smaller buildings dedicated to minor Hindu deities. Again, the carvings are spectacular. 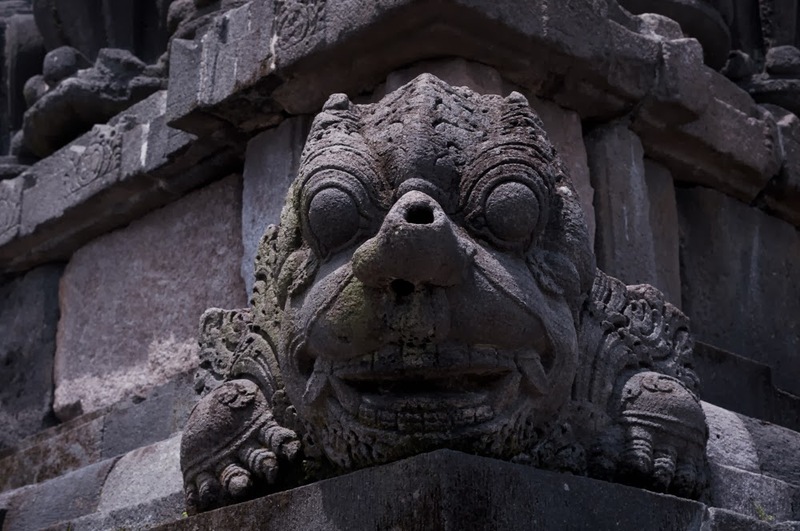 Unlike Prambanan, the carvings don’t cover every surface, just almost every surface. 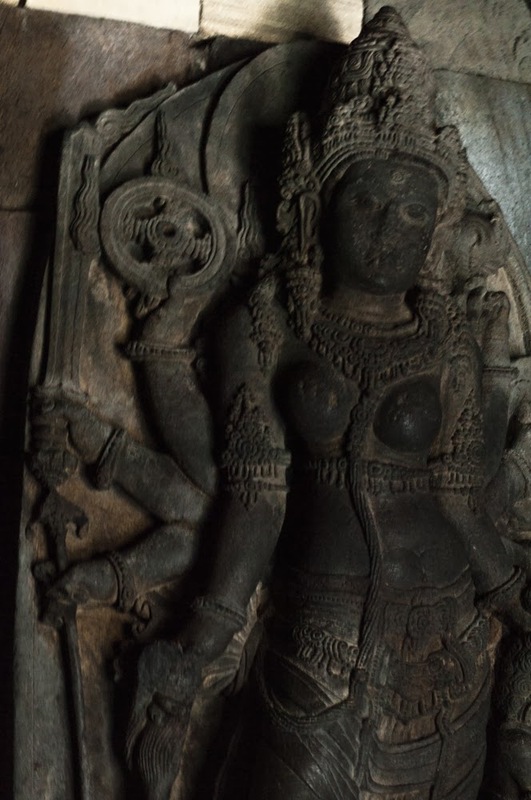 The carvings here seem to be meant to help the visitor read the stories on the wall as they pass through the temple. They felt more accessible to the common man. Also, they had excellent gargoyles. In both temples, drainage was worked into the fundamental architecture. I realize that the architectural knowledge involved in creating the temples is immense, but this touch really drove it home for me. People who planned for appropriate drainage and built their statues to elegantly control water flow are people who have truly mastered the forms they are working with. These are beautiful creations that show the master works of hundreds of craftsman. They are to be revered for their historical and cultural significance. These places show the best of humanity, the best of what people can do when we work together and create. By the end of the day, I was in temple overload. I stopped being able to appreciate all of that. All I wanted was a nap and a plate of food. The path out to the rice fields. I realize I’m writing this a bit after the fact, but it struck me again as I am sitting in the airport. 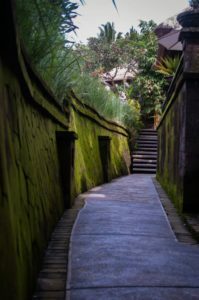 My first impression of Bali, driving through in a taxi at night, was one of high walls and open spaces. I realize this seems contradictory but give me a minute to explain. Every place seems to be walled in. 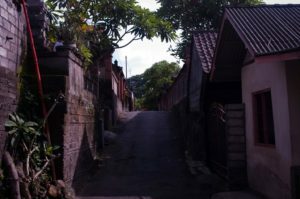 The temples are walled in, the hotel has a wall, the family compounds are walled, even the beach had a wall running along the back. The only thing that doesn’t seem to be walled in is the shop fronts, and I think they might if they could find a way to display their wares at the same time. The walls are built around very large spaces. The family compound comfortably houses fifteen or twenty people, while the hotel had over fifty rooms. Once you are inside the walls, the place is wide open. There are very few truly closed in areas. Like Vanuatu, the cooking seems to be done primarily outdoors. The communal spaces all have a (really water-tight) roof, but very few walls. The first hotel we stayed in had no rooms, except the guest rooms. The communal space was divided by a few walls, but otherwise open. A side road in Ubud. The finest example of this open-to-the-elements architecture I can think of is this airport. We have passed through 4 security check points and a ticketing counter to get to our gate, but we have yet to go through a door. Technically, we are indoors but we are not indoors. So, high walls and open spaces. Also, primary colors, white fabric, huge crowds, constant voices and the smell of frying food. Basically, the architecture here is perfectly suited to the climate. The buildings are mostly made from woven bamboo or wild cane with natangura thatched roofs. We’ll go top down. The natangura is that tropical houseplant that looks sort of like a coconut leaf. Here, it grows to be about fifteen feet tall. The individual sections of the leaf are folded over a section split bamboo and then “pinned” in place using another section of bamboo. “Sewing up” natangura takes a long time, but it also holds for several years. The sections are laid like shingles, starting and the bottom and working up until you get to the peak. The peak is natangura that is just folded over and pinned with two long pieces of bamboo that run the length of the house on either side of the peak. The structure of the house is either bamboo or a local wood that grows straight and with minimal branches. It is framed up more or less like any other house I’ve seen. The difference is that instead of using nails, they take green vines and lash the posts in place. When the vines dry, they’re pretty much impossible to move. The natangura is attached the same way, a vine around the bamboo than around the rafter. The walls in our area are all woven bamboo. It is a pretty neat process. First, you half the bamboo. Then you take an axe and crack bunches of holes in it the long way. Then you flatten it out and trim off the section bits. It makes a multi-yard by two to five inch section of bamboo with bunches of small cracks running through it. These are woven like the matts and baskets are woven. That forms a wall which can be cut to size as appropriate. These walls are amazing because they let in a slight breeze. The breeze is absolutely necessary here. The sheet of woven bamboo is fasten to the studs by another layer of bamboo. This is a third or so of a piece that lays reasonably flat on its own. The bamboo is placed on the outside of the wall and nailed in place through the wall, pinning the wall to the stud. Traditionally, the floor is dirt covered in coconut leaves and matts. In our house, we have a cement floor. It is sort of awesome because it stays nice and cool during the day. Other non-traditional methods of construction include corrugated iron roofs and walls, cinder block construction, heat-reflecting under layers to metal roofing, solar panel installation and screens on the windows. In traditionally construction, all the materials are not only local and suited to the environment, but they are also highly sustainable and re-grow very quickly. I’m totally impressed.